New York: London: C. Scribner's Sons, 1934. Hard cover. Very good in very good dust jacket. xiv p., 1 l., 512 p. incl. front., plates, ports., maps. 23 cm. Includes: Maps, Portraits, Plates. Bison Books. PAPERBACK. 0803294247 New Condition. . New. New York: Charles Scribner's Sons. 1958. First Edition; First Printing. Hardcover. Very Good+ in a Very Good+ dust jacket. Owner pressed in stamp. ; 8vo 8" - 9" tall; Original unclipped dust jacket protected by archival Brodart cover. All domestic orders shipped protected in a Box. .
Bison Books. PAPERBACK. 0803294247 Like New Condition. . Fine. THOMASON, John W. Jeb Stuart. N.Y., 1953. Illus. maps. 512pp. Fine in d/j. New York. : Mallard., 1992.. Reprint.. Hard cover. . Fine copy in fine dust jacket (in mylar).. Octavo.. Illustrated. . Photograph of OUR copy available upon request. New York. : Konecky & Konecky.. Reprint.. Hard cover. . Fine copy in fine dust jacket (in mylar).. Octavo.. Illustrated. . Photograph of OUR copy available upon request. New York: Charles Scribner's Sons. Very Good- in Very Good- dust jacket. 1958. Hardcover. Dust jacket edge worn, price blacked out on flap and water stained on back. Back board water damaged at bottom corner. Rest of book in very good condition. ; 8.5" tall . (STUART, JEB). THOMASON, John W. Jeb Stuart. [N.Y., 1992]. Illus. Maps. xiv, 512pp. Fine in d/j. New York: Charles Scribner's Sons, 1958. very good hardcover with dust jacket. 1958. Some foxing to fore-edge.. Hardcover. Very Good/Very Good. New York: Charles Scribner's Sons, 1958. Fine in NF dj. Flaps on dj slightly age toned on top edges. ' 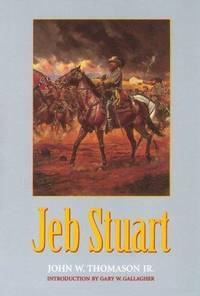 Jeb Stuart, by John W. Thomason, jr. Captain, US Marine Corps; with illustrations and maps by the author.' 512 pages; illustrated; 22 cm. Includes Index.. Hard Cover. Fine/Near Fine. 8vo - over 7¾" - 9¾" tall. New York, New York, U.S.A.: B D D Promotional Book Company, Incorporated, 1992. "gives a rare insight into a man equally at home in the crash of battle or sitting quietly on the porch at dusk with his wife and children".. Reprint. Hard Cover. Fine/Fine. New York: Charles Scribner's Sons, 1958. Fine in NF dj. Flaps on dj slightly age toned on top edges; slight bleeding from cloth to inside bottom edge. 'Jeb Stuart, by John W. Thomason, jr. Captain, US Marine Corps; with illustrations and maps by the author.' xiv p., 1 l., 512 p. incl. front., plates, ports., maps. 23 cm. . Hard Cover. Fine/Near Fine. 8vo - over 7¾" - 9¾" tall. New York: Charles Scribner's Sons, 1958. NF in VG+ dj. Book plate on free end paper. Clean and tight. 'Jeb Stuart, by John W. Thomason, jr. Captain, US Marine Corps; with illustrations and maps by the author.' xiv p., 1 l., 512 p. incl. front., plates, ports., maps. 23 cm.. Hard Cover. Near Fine/Very Good +. Illus. by John W. THomason. 8vo - over 7¾" - 9¾" tall. Scribner's Sons. Used - Very Good. Hardcover w / dustjacket. . Very good condition; edges, corners, and covers of book show minor wear. No underlining; no highlighting; no internal markings. DJ is vg; bump and repaired closed tear to spine. "Civilwar 20140404" Stored in sealed plastic protection. In the event of a problem we guarantee full refund. 1958. Hardcover w / dustjacket. Charles Scriber's Sons, 1958. 1st ed., 1st ptg. Thus. Scriber's ÒAÓ. Hardcover. VG+/VG+. 512pp. Red cloth. Illus. by auth. Frequently reprinted, ÒJeb StuartÓ is a classic biography of one the South's birghtest stars. This copy is in beautiful condition with only minor wear and two closed tears to the d.j. Price of 9.95 is intact. Bds. are bumped and lightly edgeworn. We insure all purchases over $50. USA: Scribner's, 1934. Long inscription and other notes on front pastdown and front endpaper. In a loose polythene protector. . Reprint. Hardback. VG/G+ pc DW. New York: Charles Scribner's Sons, 1958. THIS IS A BEAUTIFUL COPY IN DJ OF THIS IMPORTANT VOLUME.....JEB STUART..BY JOHN THOMASON.......COLORFUL DJ.... HARDBOUND. Hard Cover. VERY GOOD/VERY GOOD. Illus. by Illustrations and Maps By Author. 9x6. Military History. Mallard Press, 1992 Hard cover. 4. Very good in very good dust jacket. Very tight binding, clean pages. Two tiny specks on side page edge. Minor wear to edges of dust jacket, one tiny edge tear to top front. 512 p. .
New York: Charles Scribner's Sons, 1958. Second edition. Hardcover. Very Good +/good +. Clean, tight 8vo, 512p. Book has light bumping to tail of spine. Dust jacket has light chipping to top edge and some shelf wear, but is in generally very good shape, just slightly tanned on the back, On May 3, 1863 Jeb Stuart took command of II Corps and lead it into action at chancellorsville and became one of the great symbols of the Confederacy. He was a bold, spectacular commander and a romantic figure of the Civil War who inspired the men in his command and set the hearts of the little southern belles pitty pattering. A good read! New York and London: Charles Scribner's Sons, 1953. Hardcover. Very Good/Good. 8vo. 512 pages, indexed. Hardcover with a black pictorial dust jacket. The jacket has a chip at the top left corner of the front panel. Secure inner hinges. Text is clean. New York: Charles Scribner's Sons, 1958 This is a look at Stuart's youthful days in Virginia at West Point, and on frontier duty agains the Indians in Texas to his long and dramatic record in the Civil war. Book is in very good condition with light wear; jacket is in good condition with rubbing, wear, and soil. 512 indexed pages, 8.5 x 5.5.. Hard Cover. Very Good/Good. Illus. by Thomason, John W..
New York: Charles Scribner's Sons, 1958. Book. Very Good. Hardcover. A sliver missing from lower edge of cloth's spine. Jacket is light worn. Slight creasing to front flap. New York: Charles Scribner's Sons, 1941. THIS IS A GOOD HARDBOUND COPY OF THIS IMPORTANT VOLUME...THE ONLY MARKINGS BEING A PREV OWNER PRESENTATION ON FRONT FLYLEAF....JEBB STUART BY JOHN THOMASON.. HARDBOUND. Hard Cover. GOOD/No Jacket. Illus. by Illustrations and Maps By Author. 9x6. Military History. Lincoln NE: Bison Books , 1994. With illustrations and maps by the author. Introduction by Gary Gallagher. 512 pages. Red remainder mark on bottom edge.. Paperback. Near Fine. 6 x 9 ". Bison Books. Used - Good. Ships from Reno, NV. Former Library book. Shows some signs of wear, and may have some markings on the inside. 100% Money Back Guarantee. Shipped to over one million happy customers. Your purchase benefits world literacy! Bison Books. Soft cover. 0803294247 Minor Foxing/Minor Thumbing To Edges, Else Tight And Clean. . Very Good. 1994. Lincoln NE: Bison Books, 1994. Acceptable in illus wrappers with corner wear with lamlift; narrow creases at front fore-edge and rear tail; sticker residue on spine and front; both wraps uplift; sl scuffing on rear. Ow clean, unmarked, tight, bright, sound.. Soft Cover. Acceptable/No Jacket. 8vo - over 7¾" - 9¾" tall. Used. Scribner's. Used - Good. Ships from the UK. Shows some signs of wear, and may have some markings on the inside. 100% Money Back Guarantee. Your purchase also supports literacy charities. B D D Promotional Book Company, Incorporated, 1992. Hardcover. Very Good. Disclaimer:A copy that has been read, but remains in excellent condition. Pages are intact and are not marred by notes or highlighting, but may contain a neat previous owner name. The spine remains undamaged. At ThriftBooks, our motto is: Read More, Spend Less.Dust jacket quality is not guaranteed. B D D Promotional Book Company, Incorporated, 1992. Hardcover. Good. Disclaimer:A copy that has been read, but remains in clean condition. All pages are intact, and the cover is intact. The spine may show signs of wear. Pages can include limited notes and highlighting, and the copy can include previous owner inscriptions. At ThriftBooks, our motto is: Read More, Spend Less.Dust jacket quality is not guaranteed. U.S.A.: Bison Books. Soft cover. 0803294247 A Beautiful Book From Private Collection. This Book Is Very Clean, Tight And Bright. Book Shows Very Little Wear. This Book Looks Almost New! Not Remainder. Not Ex-Library. . Fine. 1994. Smithmark Pub. Hardcover. POOR. Noticeably used book. Heavy wear to cover. Pages contain marginal notes, underlining, and or highlighting. Possible ex library copy, with all the markings/stickers of that library. Accessories such as CD, codes, toys, and dust jackets may not be included. Bison Books. Paperback. GOOD. Spine creases, wear to binding and pages from reading. May contain limited notes, underlining or highlighting that does affect the text. Possible ex library copy, thatâll have the markings and stickers associated from the library. Accessories such as CD, codes, toys, may not be included.